Perfect for any KISS fan. KISS-themed tin tote contains 4 coasters and a travel mug. Each item has its own unique artwork. Add this gift set to your collection today! One outrageous KISS Tin Tote Gift Set comin’ right up! 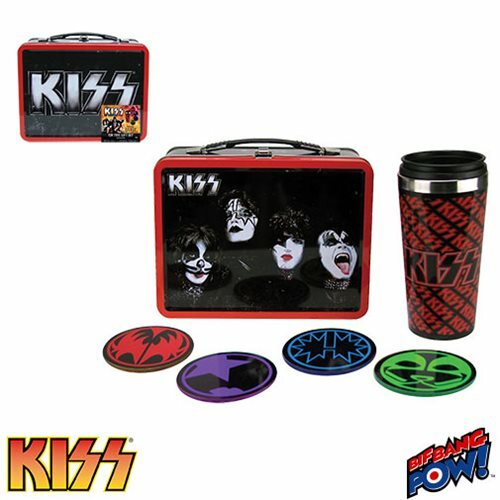 Don’t miss this KISS-themed gift set from Bif Bang Pow!. It’s perfect for loyal fans and collectors alike. The KISS-themed tin tote measures 8 5/8-inch wide x 6 3/4-inch tall x 4-inch deep and features striking 4-color artwork of The Demon, Starchild, Spaceman and Catman on one side and KISS logo with a distressed background on the other side. A KISS logo pattern appears on the sides with bright red highlights throughout. What, there’s more?! That’s right, inside you’ll find a set of 4 coasters and a travel mug. Set your drink down on a coaster featuring the iconic makeup of your favorite KISS member in their character color. Measuring 3 1/2-inches in diameter, these KISS coasters are made of wood with a cork backing. Stay hydrated on the go with the KISS travel mug. This 7-inch tall, 16 oz. mug features a repeating KISS logo pattern in bright red on a black background. Hand wash only. Not dishwasher safe. Do not microwave. Thoroughly hand wash before first use. BPA Free. Ages 14 and up.